While this week’s Handmade52 project isn’t something new to me, it was a special request, and something that I haven’t made since August (really?!) (sidenote: having now been posting regularly on flickr since the fall of 2006, it sure does make looking back in time for tidbits like “when did I last make chili?” much easier!). Anyway! 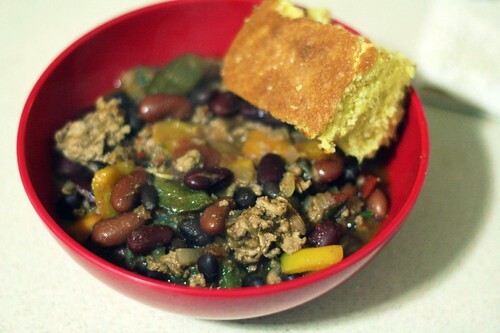 I made chili and a double batch of corn bread and it tasted better than I remember. (I made it spicier than I would normally for Dan, and I liked it more than I expected to.) Here’s my version of the recipe, just for my own records. Start by cooking the onions, garlic, bell peppers, and hot peppers in a few tablespoons of oil. Once things start to soften, stir in cocoa powder, chili powder, cumin, and salt. Cook for a minute or two, then add in ground turkey. Stir regularly while the turkey browns to make sure it’s cooking evenly. Once the turkey is evenly cooked, stir in diced tomatoes and a half a bottle of beer. Let that come to a boil, then simmer for 15 minutes or so. Once the flavors have all combined, stir in the beans (drained and rinsed), and a handful of chopped cilantro. Heat until the beans are hot. Top with grated cheddar, unless you are a cheese-hater. This chili recipe is like the gift that keeps on giving. Just when I think I’m tired of it, I realize that it’s pretty much food perfection. And when you go the extra mile and add cornbread?! Yowza! I hope Dan’s feeling better! now i say that, and it will suddenly be in the 60s for a week. but i guess that would be a win-win, right? mmmmm turkey chili!!! damn it Elizabeth, now I want chili. Ooooohhhh Joel!!! Haha… can’t you post photos of pizza again.